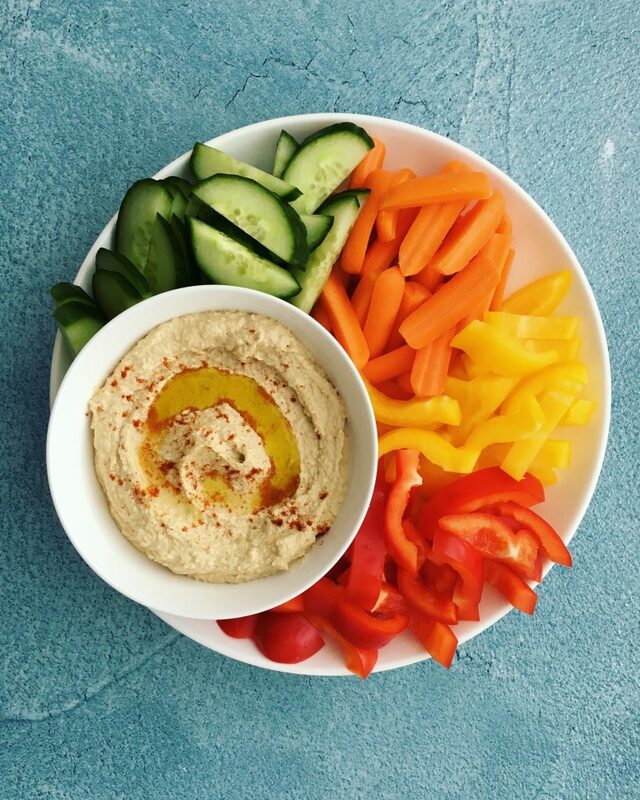 Hummus with a side of veggies is one of my favorite snacks. 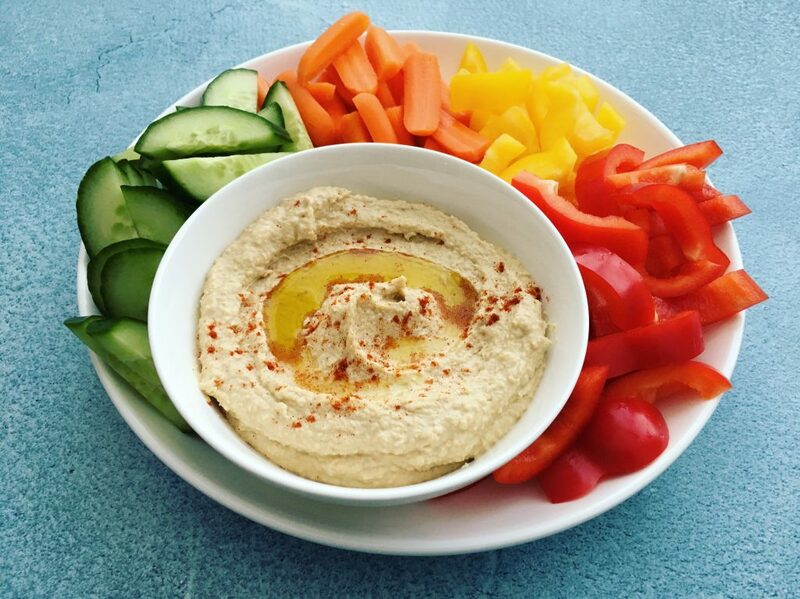 When you go to the grocery store there are so many different varieties of hummus including roasted red pepper (yumm), garlic, olive, etc. but hummus is one of these things that we often forget just how easy it is to make at home! As you know, both of us have a handful of GI issues and people often ask me “What do you two even eat?”. Well, we eat a lot, but most of it is from home. Rarely do you we venture out to eat. On the weekends I cook three meals a day for us due to our restrictions. I also meal prep as much as possible for the week so no only do we have dinner but also snacks, lunches, and the occasional sweets. Both Bryan and I follow a modified Low FODMAP/Gluten Free/Mostly Diary Free diet. Why? Well we both have IBS, I have Celiac Disease, he has a wheat intolerance and oral allergy syndrome. A match made in foodie heaven huh?? I will say this, I do not promote restrictive eating for everyone unless it is medically necessary. Four of Bryan’s biggest triggers are: garlic, onions, HFCS, and honey. Try finding items at the grocery store, Whole Foods and Trader Joe’s included that don’t contain these items…mostly the garlic and onions, they are in everything from canned products, frozen items, anything pre-made, your spice blends, and you guessed it…hummus. Thankfully my background is culinary; I’m a graduate of Johnson & Wales University and a Certified Culinarian through the American Culinary Federation. I have been able to manage our restrictions pretty well over the years and yes, there are challenges, especially with spices (stay tuned for a post about this soon), but I love it at the same time. I love the challenge of finding creative, delicious ways to feed him (and myself) despite these restrictions. I also love helping others with similar restrictions to re-formulate their favorite recipes so they may once again be enjoyed by all. Now, you may be thinking “Isn’t hummus made of chickpeas and therefor high FODMAP?” the answer is yes and no. Yes, it is made from chickpeas and technically speaking they are considered high FODMAPS, however according to Monash University 1/4 cup of canned chickpeas is considered low FODMAP. How is that possible: because the oligosaccharides in the chickpeas leach in the water, lowering the FODMAP content of the chickpeas (make sure you rinse them well before using). Additionally tahini is also considered to be low FODMAP at 1 Tablespoon and high at 2+ Tablespoons. I used two tablespoons of tahini in the recipe below, however when you spread this out over 6-8 servings, you are well within the limits of low FODMAPs. 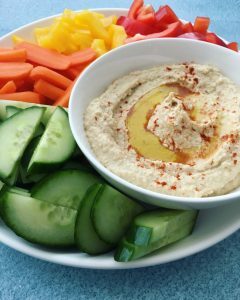 Garlic, another traditional ingredient in hummus is high in FODMAPS, to achieve the much beloved garlic flavor in my hummus, I used garlic infused oil instead. The recipe below takes all of this in to consideration. To serve – drizzle top with garlic infused oil and sprinkle with paprika. Serve with veggies of your choice (carrots, cucumbers, peppers, etc. ), tortilla chips, etc.